The Dubai-based Global Education Management Systems (GEMS Education) is going worldwide. Currently, the company manages more than 100 schools in the Middle East – in Dubai, Abu Dhabi, Fujairah, Sharjah, Saudi Arabia, Qatar, Jordan and Libya – and in the United Kingdom, India and South Africa. There are plans to expand to East Asia, China and the Pacific Rim region. In April, GEMS’s main academy in Dubai played host to former U.S. President Bill Clinton, who announced that the company would become a strategic partner of the Clinton Global Initiative. The driving force behind this enterprise is Sunny Varkey, who began the business with the school his parents used to run in Bastakiya, a part of old Dubai. The annual turnover of Varkey’s education business is estimated at close to $500 million. He is diversifying into healthcare, with two hospitals and a chain of clinics in Dubai already under his belt. What’s the connection? Both are recession-proof, says Varkey. But both enterprises are not without challenges. When faced this year with a mandated tuition cap by Dubai, Varkey publicly announced he would possibly close some of GEMS’s older schools in the city unless the government provided financial support, or allowed the company to raise fees. In this interview with Knowledge@Wharton Arabic, Varkey spoke about what makes his schools and his business tick. Knowledge@Wharton: How did you get into the field of education? 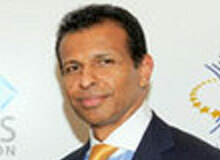 Sunny Varkey: I came to Dubai from India with my parents in 1959. I was 12. My parents were teachers. Though my father took up a job in a bank, he used to give [lessons] in English language skills to working people after office hours. My mother joined him, and they both carried on with private [lessons] for a long time. This small venture grew into Our Own English High School, founded in 1968 to cater to the Indian community. When I returned from my studies in India and the U.K., I saw the huge potential. Meanwhile, the Dubai authorities wanted us to move the school to new premises. We did, [and moved] into something bigger and better. That’s how our journey began. Knowledge@Wharton: When Our Own English High School was started, what was the state of education in the United Arab Emirates? Varkey: In 1968, when my parents started our first school in Dubai, the demography of the United Arab Emirates included a large population of Indian expatriates. There was also a sizeable population of Arab and Western expatriates. Our schools catered to the entire demography of that time, not only Indian students. But once our [newer] schools opened, more Indians started bringing their families to Dubai, because they were assured of quality Indian education. As the education industry here grew, fewer men came alone for work; they began to bring their families from all over the world. Knowledge@Wharton: How and when did the locals realize the value of education? Has the distribution of students in your schools shown a change since the early days? What is your range and reach now? Varkey: UAE nationals have always known the value of education and Sheikh Rashid Bin Saeed Al Maktoum was keen on providing quality education to his people. He encouraged young UAE nationals to pursue their studies abroad, and several of them have gained higher education in India. Over the years, there have been gradual shifts in the demography of the UAE. [There once was] an expatriate community that was largely from India, [but] there are today over 200 nationalities in Dubai. The changes in the population had to be reflected in the choices of schools offered to those that lived here. International curricula from around the world had to be offered to cater to the need of the expanding diversity of the population. The success of GEMS Education would not have been possible without the support, attention and care provided by the ruling families in Dubai and Abu Dhabi. Through visionary leadership, the UAE has become known around the world as a center of excellence and a great promoter and supporter of the knowledge economy. GEMS Education has played a key role in this. It is also because of this visionary leadership that Dubai has become a city of choice for many parents. With more than half the population [2.4 million] aged between 15 and 39, and roughly one quarter being less than 15 years of age, it is inevitable that the "learning" market in the UAE is large. This is where GEMS Education has been able to provide a variety of [schools with] different curricula to the evolving population of the region. The GEMS model of schools is unique in the world. We offer a variety of different curricula at varying price points, so that quality education is made accessible to as many students as possible. Knowledge@Wharton: In the Gulf, you cater to all economic classes. You have likened yourself to a passenger airline carrying economy, business class and executive class passengers; customers are charged different fares, but the destination is the same. Is this the same model you are using in other countries? Varkey: Our basic objective is to provide quality education accessible to the majority of the population in all the markets we operate in. Therefore it is imperative that we have schools that cater to different sections of society. For example, as a way of highlighting the variety of schools we offer, GEMS World Academy is a state-of-the-art premium plus school, which caters to around 1,000 students at a tuition rate of $25,000. It follows the International Baccalaureate (IB) curriculum, which allows students to learn through projects and research, giving them broader knowledge that is not restricted to textbooks. At the other end of the spectrum we have the extremely popular and successful Our Own English High School brand of schools, which cater to thousands of students. The Our Own English High School, Dubai currently has almost 8,000 students and costs around $1,360 a year. All GEMS schools provide high-quality education, an education that has students achieving exam results higher than home-country averages. For example, in 2009, in the [Indian Central Board of Secondary Education] examinations, GEMS Grade 12 students had a pass rate of 99.1%, compared to the national average in India of 81%. For the CBSE Grade 10 examinations, GEMS students excelled with a 100% pass rate; the national average in India was 88.84%. The average exam results achieved in the International General Certificate of Secondary Education (IGCSE) by students in the GEMS schools teaching the national curriculum for England were 22% above U.K. averages. Knowledge@Wharton: In the U.K. you are managing the first privately-run state school. The school serves middle class families. But the lower end of the spectrum is subsidized by the government and, as a for-profit organization, is a market you cannot enter. The upper end is occupied by classy public schools, where you need heritage and credentials. It will be difficult to break out of your silo. What are your thinking and plans? Varkey: GEMS is currently operating 11 schools in the U.K. and has plans to expand its network. Anders Hultin has been appointed the CEO of GEMS Education U.K. He is an educational professional with more than 18 years experience of marrying together pioneering approaches to education with cutting-edge business thinking. Between 1991 and 1994, Anders worked as a political advisor to the Swedish Ministry of Schools. During that time, his work focused on the voucher regime in Sweden. The voucher regime is now held up as a worldwide role model for countries that would like to introduce innovations and competition in education. Knowledge@Wharton: In some places, your schools are running on the supermarket chain concept [with] reduced prices because of economies of scale; sharing teachers and other resources and global sourcing of teaching talent. Do you see this as part of your group philosophy? Varkey: No, we do not subscribe to this metaphor of providing education like a supermarket chain. Education is a serious proposition for us; it goes beyond business. With 50 years in education, GEMS has the experience and commitment to provide quality schools to cater to a broad cross-section of the community. Knowledge@Wharton: There is a controversy over whether education should be for-profit or non-profit. What is your view? Varkey: Both play their part. A for-profit company such as GEMS Education believes in education for profit because it enables us to reinvest in education and help establish more schools for more children. At the end of the day, you can call it a surplus or [a] profit [but] it’s all the same thing. Even a not-for-profit school reports a surplus. In our case, we call that profit. People have a [misunderstanding] about this industry. When we build a school we invest $13.6 million to $27.2 million. We don’t take donations, charity payouts or deposits. So before the first child is enrolled, we have already put the investment in. From the time the school is built, every day we have to ensure that we are giving children and parents value for money because they are not compelled to be in our schools. Almost 100,000 children come to our schools every day because we deliver. We take the risks and believe in long-term investment. This industry is not about quick money, it has taken us 50 years to reach this point. Knowledge@Wharton: What is your presence in the education field in different countries? Varkey: GEMS Education is involved in projects in India, Africa, the United States, the U.K., China and the Middle East. Within the Middle East region, we are involved in about 60 school projects. We have projects in a few different locations at different levels of completion. In China, the Sino-Singapore Tianjin Eco-City Investment and Development Co. has embarked on a joint venture with GEMS Education to co-develop GEMS’ first flagship greenfield international school in Tianjin China – the GEMS World Academy (GWA). We have schools in India and the U.K., and a few others in the pre-operational and consulting stages in the U.S. and the Pacific Rim, East Asia and China. Knowledge@Wharton: Why get into the healthcare business in addition to education? Varkey: We run the best schools. Around 85% of the population here is made up of outsiders. For them, the most important questions are: Are there good schools, good hospitals and healthcare facilities here? This is where we come in. Our group employs 10,000 people. We have partnered with GE in healthcare and with private equity firm Abraaj Capital in education. Knowledge@Wharton: How do you see your education empire evolving? Varkey: We are growing both organically and inorganically. In the next 25 years, I see 5,000 schools with 5 million children. And there will be no compromise on quality.